Level footpath, gradual grades. Snow and avalanches on trail can persist into early summer. Downed trees can impede travel year round. Winter travel is difficult between Lower and Upper Russian Lakes. Scenic overlooks of Russian River, panoramic views of mountains. Potential multi-day trip using designated campsites at Lower/Upper Russian Lakes or Barber, Aspen Flats, and Upper Russian Lake Cabins (3.4, 9, and 12 miles), by reservation only. Easy day hike from Russian River Campground to Russian River Falls (Mile 2.4) . From Russian River Campground the first 3 miles of trail are heavily used for fishing access to Russian River and Lower Russian Lake. Along trail, reddish-gray, dead trees killed by spruce bark beetle. These trees are a major fire hazard. Skiing is usually good from Russian River Campground to Barber Cabin; however, there are major avalanche zones to cross. Wildlife includes moose, bears, wolves, Dall sheep and mountain goats. Hunting for these species is permitted in designated seasons. Fishing in Russian River provides the largest sport fishery in Alaska for sockeye salmon during two runs, starting mid-June and mid-July. Fishing for any salmon species is not permitted upstream of Russian River Falls. Rainbow Trout fishing between and in Upper/Lower Russian Lakes. Review Alaska Department of Fish and Game (ADF&G) hunting and fishing regulations. Use caution with bear and moose. Giardia (a microscopic parasite that can infect warm-blooded animals and humans) could be present in all open water sources, filter surface water before drinking. Winter travel may be hazardous due to avalanches, thin lake ice, and white out conditions above tree line. Winter travelers need to be able to evaluate avalanche and over-ice travel hazards. Be prepared for rapid weather changes. Remember to pack out your trash. You can contact a U.S. Forest Service office to receive more detailed information on safety precautions and Leave No Trace outdoor skills and ethics. At Mile 52.6, Sterling Highway, turn into Russian River Campground. Trailhead parking is 1 mile further, not plowed in winter. At Mile 48, Sterling Highway, turn onto Snug Harbor Road, travel 9 miles to Cooper Lake Road, 3 miles further to parking. Cooper Lake Road is not plowed in winter. Snug Harbor Road may be icy. 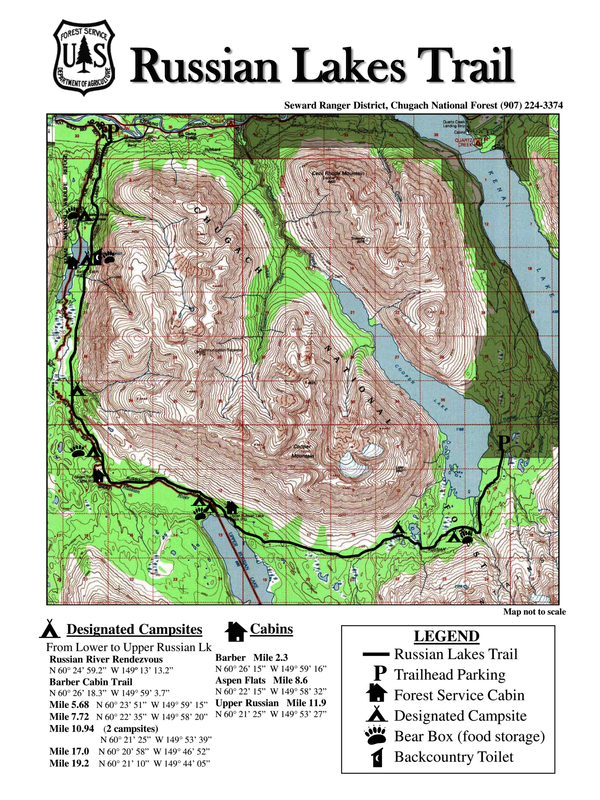 Trail is closed to saddle/pack stock from April 1-June 30 and motorized vehicles year round from Lower Russian Lake trailhead to Upper Russian Lake cabin. 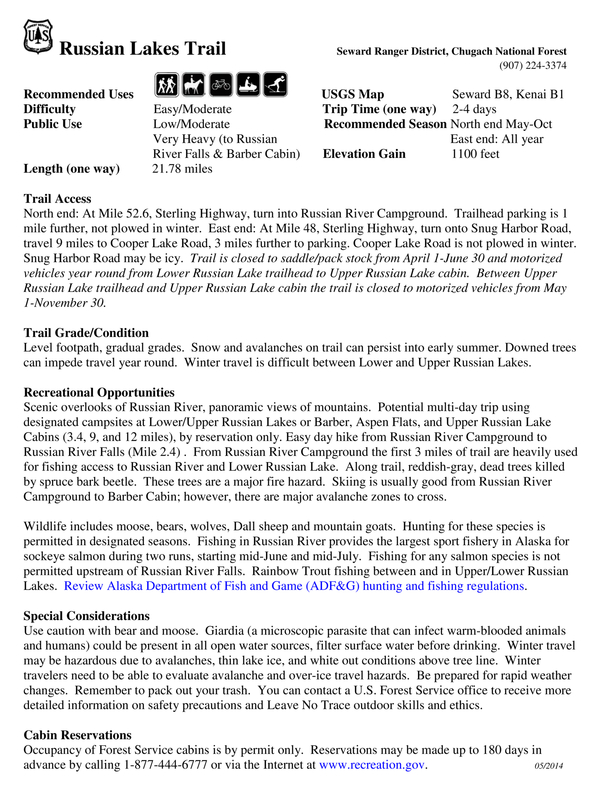 Between Upper Russian Lake trailhead and Upper Russian Lake cabin the trail is closed to motorized vehicles from May 1-November 30.